This is a kind of glove box designed for manufacturing units of lithium ion. 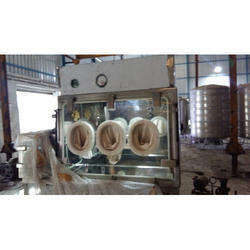 It has gas provision with accuracy and filters for clean room usage. Following clients' diverse requirements, we bring forth an all-encompassing collection of Glove Boxes For Labs. The provided glove boxes provides a reliable yet economical way to conduct air sensitive reactions under inert conditions. S.S. Glove Boxes are used by Atomic Research Institutes to carryout research of radiation of various radioactive materials. Manufactured from Stainless Steel 304L, IS:2064 Gr. A. Client : Indira Gandhi Research for Atomic Energy, Bhabha Atomic Research Centre & Centre for Advanced Technology. Keeping the diverse requirements of customers in mind, we are instrumental in offering Laboratory Glove Box. we are offering high quality latex , rubber, examination, surgical glove boxes to our clients. 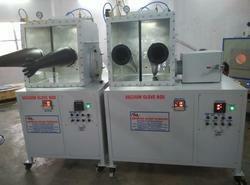 We are offering Glove Boxes those are made by using advance technology and high quality raw material. These glove boxes are highly appreciated by our clients for its durability and other unique features. Our range of glove boxes can be customized as per our clients specific requirements.